For many artists and designers, creative expression starts on paper with the help of a favorite pencil, pen or brush. Only after starting their concepts on paper and scanning the results do artists and designers fire up their computers and start their digital workflow. But what if one could skip the scanning step and have editable, digital ink versions of sketches available at the touch of a button with the power to refine and complete the sketches later with Wacom’s most natural pen tablet experience? Enter the new Wacom Intuos Pro Paper Edition – The pen tablet that works the way you do. 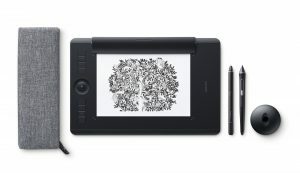 Today, Wacom presents their new Intuos Pro and Intuos Pro Paper Edition of pen and touch tablets to the global creative community and they will be shown for the first time at the ShowStoppers event during CES on January 5th, from 6PM to 10PM, at the Wynn Hotel in Las Vegas, Nevada. The new generation Intuos Pro provides a wealth of new features and benefits to artists, designers and photographers who demand the very best from their creative tools. The new Pro Pen 2 anchors the overall creative experience with enhanced pressure-sensitivity and precision, but it’s the Intuos Pro Paper Edition that really stands out by giving users the ability to incorporate paper into their creative workflow. Ink-on-paper drawings are captured and stored digitally on board the Intuos Pro Paper Edition and can be refined later on the tablet with any compatible layered raster or vector software application. Gone are the days of tedious and time-consuming scanning. Less than half an inch thick, the next-generation Intuos Pro is the slimmest of its kind and more compact than the previous version, offering the same sized active area in a smaller overall footprint. The Intuos Pro occupies very little desk space and is easy to carry in a backpack or laptop bag for the daily commute or a business trip. It comes equipped with anodized aluminum backing, a smaller pen stand with 10 nibs and a new pen case. Both sizes of the Intuos Pro, Medium and Large, use a TouchRing, Multi-Touch and eight ExpressKeysT for the creation of customized shortcuts to speed up the creative workflow. Available in Medium and Large models, Intuos Pro is Bluetooth-enabled and compatible with Macs and PCs. The Intuos Pro comes with the Wacom Pro Pen 2, pen stand and features eight ExpressKeysT, a TouchRing and multi-touch gesture control. 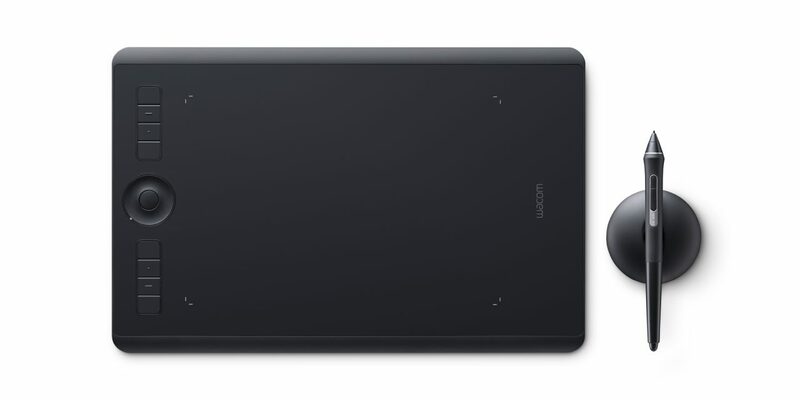 The Intuos Pro Medium ($349.90 USD) and Large ($499.90 USD) will be available in January.